Staff at Queen's University in Belfast are to be paid their salaries three days early this month due to "ongoing uncertainty relating to Brexit". 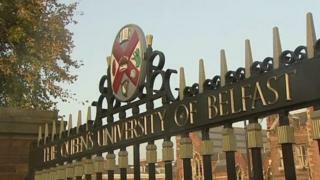 QUB staff are usually paid on the final working day of every month. However, because of fears about the potential impact of the UK leaving the EU without a deal, this month's payment date was brought forward to Wednesday, 27 March. The UK's departure date had originally been set for Friday, 29 March. That will be pushed back to 22 May if Prime Minister Theresa May can get her withdrawal deal through Parliament next week. In a statement, Queen's University said it had "put in place a number of contingency plans to reassure our staff and reduce risks to business continuity". "This includes the practical step of paying salaries earlier than usual for March 2019 to avoid any potential disruption and inconvenience in the unlikely event of banking or payments processing issues on the original withdrawal date of 29 March." The university said it is also providing "regular information events for international staff and dedicated web resources to keep staff and students informed as the situation evolves". Speaking to BBC News NI, economist John Simpson expressed surprise at the move. "I haven't heard of any other organisations doing this," he said. "Obviously there are all sorts of major preparations for Brexit going on in the public sector, but there's no indication that the banking system is going to be disrupted." Last month, Bank of England governor Mark Carney warned that a no-deal Brexit would create an "economic shock" to the global economy.